U.S.A. Olympic gymnasts teach dance class for kids to help launch video game. Aly Raisman and Simone Biles are perhaps best known as being members of "The Final Five", the USA gymnastics team that cemented their place in history after bringing home gold in the 2016 Rio Olympics. Since then, the girls have been everywhere, from music video appearances to red carpets. 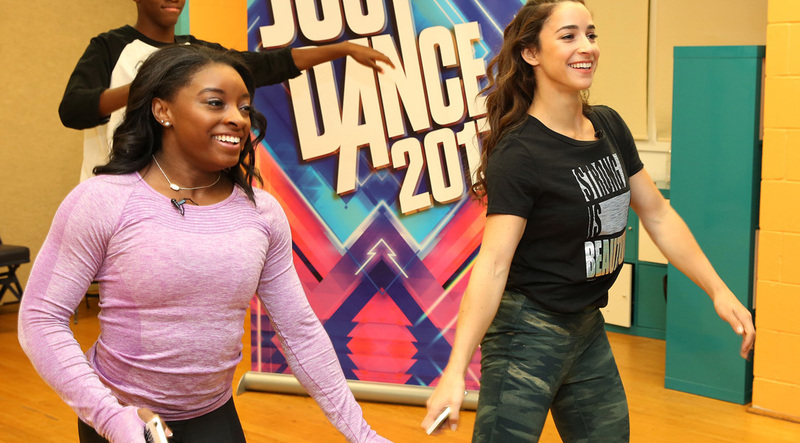 Just recently, Aly and Simone attended the 2017 Just Dance launch event, where they held a dance class for the kids at the Kips Bay Boys and Girls Club in the Bronx. Read on to find out what cheat meals they love, and their least favorite exercises. Hint: even Olympic gymnasts hate running! Muscle & Fitness Hers: How was the experience of interacting with the kids and getting to dance and play around with them? Simone Biles: It was a lot of fun because these kids look up to us so much and for us to come and have the opportunity to talk to them, and not just talk to them but dance with them was really cool. Aly Raisman: They were so cute; it was really a lot of fun for us. M&F Hers: What is your fitness routine like? Aly: We all do different stuff, I think that’s the cool thing about American gymnastics is that we all have different coaches so we all have different styles. Simone and I probably do more conditioning than any other gymnast in the world, I would say. We do a lot. Every coaching style is different but I’d say our style is more powerful than graceful or flexible. We try to have both but we kind of try to, we’re more known for our power. So we try to work out, I like to run, even though sometimes I don’t really like to run. Yeah just cardio mixed with box jumps and leg conditioning, arms, stomach, everything. M&F Hers: What’s the workout that you just hate the most? Aly: I don’t love running, but I do it. It depends on the mood. Simone: It depends, but once you start, about 10 minutes into the workout, you’re good. M&F Hers: What’s your favorite cheat meal? Simone: I don’t really eat like a lot of it, but brownies or ice cream are just so good. M&F Hers: What do you do like to do on your days off? Simone: Usually stay in bed and watch Netflix. Aly: But we do have to get up. We would only get Sundays off [during training] so we would get up because we knew our coaches would be mad at us. Simone: I would go to church with my mom and my sister, and that would start off the day, and then I’d come home, and eat breakfast. Sunday is like a family day so we would always be doing something. M&F Hers: How do you motivate yourself on days when you just don’t want to train and workout? Aly: I think the Olympics are enough motivation for us. Simone: Yeah, I think just the word “Olympics”. M&F Hers: Aly you were on Dancing with the Stars a few years back, and now your teammate Laurie Hernandez is on the show. Have you two been watching? Simone: She’s amazing I am really hoping that she wins. Aly: I’m actually going to cry if she doesn’t win. Simone: Oh yeah, oh definitely. Aly: We’ll probably put it out there like 8 million times on Instagram so that people will vote [for her]. We just really hope she wins, she’s been working so hard, 24/7, and she really deserves it. Aly: Yeah, she’s very disciplined. M&F Hers: What’s next for you and your careers? Simone: We’re definitely going to take some time off and relax, before going to the next Olympics cycle! Just Dance 2017 is available now on Wii, WiiU, PS3, PS4, Xbox 360, Xbox One and PC.